I first wanted to play drums but that was too loud for my parents, so they bought me a classical guitar and I took classical guitar lessons. 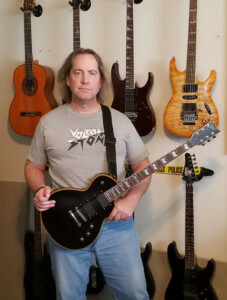 In my mid-teens I was listening to rock and metal bands like Judas Priest, Rush, Iron Maiden, Yngwie Malmsteen, Joe Satriani, Steve Vai, Dokken and many more which I learned to play most of their songs. By the time I turned 21 years old I knew, by heart, over 2300 songs, which helped me easily get into any of the local bands I wanted to play with. I taught guitar at several music stores for a couple of years. Since then, I’ve had to pleasure of performed as a session guitarist in studios with many talented musicians and songwriters as well as composing his own material. This song goes way back to 1993. I wrote this measure by measure not knowing what was going to be next. The guitar harmonies are real and not a harmonizer. This song was played on radio stations on the west coast and noticed by a promoter from LA. and used for a backing track for a commercial on ESPN2 in 1994.
lead vocals and real drums. I’m singing backing vocals, guitar, bass, keys, ear candy. Took 14 hours from start to finish on 41 tracks. I like to remake songs that were popular as it’s good practice. This is some clips of “Still of The Night” by Whitesnake.